Last week we heard from Polly, a Code Club volunteer from Auto Trader who started her first Code Club six months ago. She has written in depth about her experiences running a Code Club in Manchester, chronicling her journey from (in Polly’s words) “ a nervous wreck to a (more or less) confident Code Club leader”. Previously we heard about the preparations Polly took before getting her club started – including securing a DBS check via STEMNET and visiting the school at which her club is hosted. Before the start of my first Code Club session I needed to make a few preparations. I printed out copies of the first three projects. From the school I had learned that some of the kids had already done the first project a few months before so I wanted to make sure I had something for them. A note on the printing: color is essential! Also the kids really didn’t like it when I printed the instructions horizontally with two sheets on each side…it may just have been their personal preference but they really did seem to prefer double sided vertical A4 stapled top left corner. These things seem quite basic and maybe even obvious; but a few times I hadn’t gotten around to stapling the instructions before hand and it resulted in a fair bit of confusion as the kids got their sheets all mixed up. They generally don’t need much excuse to get distracted, so little things like this helped keep them on the right track. The big day fina lly came; the first day of Code Club. I made sure I got there ridiculously early, but there was good need. First off, I had my DBS certificate photocopied so that the school office could keep a copy. Then there was logging in as a teacher on to one of the computers and figuring out how to use the smart whiteboard. I brought up one of the projects I had been working through on the projector so that everyone could see what they were working towards. The first session really was a blur, once they arrived it seemed like minutes until they were leaving again. I tried quite hard to learn all of their names, there were only ten of them but I still failed miserably. One of my main observations of that day was their determination to follow the instructions exactly, or not at all. This left me either trying to encourage them to think outside of the box, by choosing different sprites or to color them different colors, or futilely trying to get them to stay on track. Neither yielded positive results! However, I did eventually find that the kids responded really well to me showing them my versions of the projects they were doing. The little changes I had made to them, things as simple as color changes, really helped them to move away from just following the instructions line for line, even if they did then just try to recreate what I had done. After the first couple of clubs, I think the novelty of me as a new volunteer had worn off. The kids began being unruly, spent more time drawing sprites than programming them and would at times be on YouTube within seconds of your back being turned. This was when the promise of a certificate came in useful. I think it was around the fourth or fifth club that I welcomed them into the room with the certificate up on the screen. They were all asking how they could get one and became competitive with one another over who would get theirs first. When it came to handing these out I made sure I laminated them first so that they looked the part and the teacher took them to be presented in assembly. You could tell that this meant a lot to the kids and they were really proud of their achievement. This really helped to positively reinforce the message I was trying to get across about the need to complete projects and push the boundaries of creativity. Top Tip! 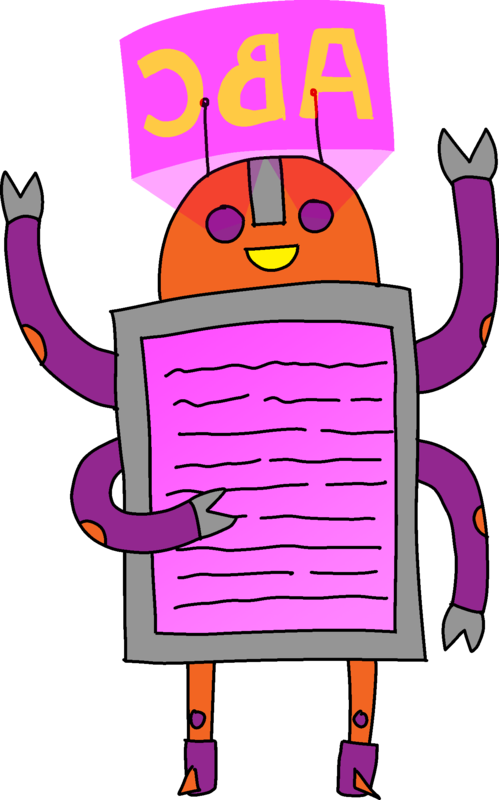 Why not team up with a colleague to run your club so you can share the responsibility of running your Code Club? 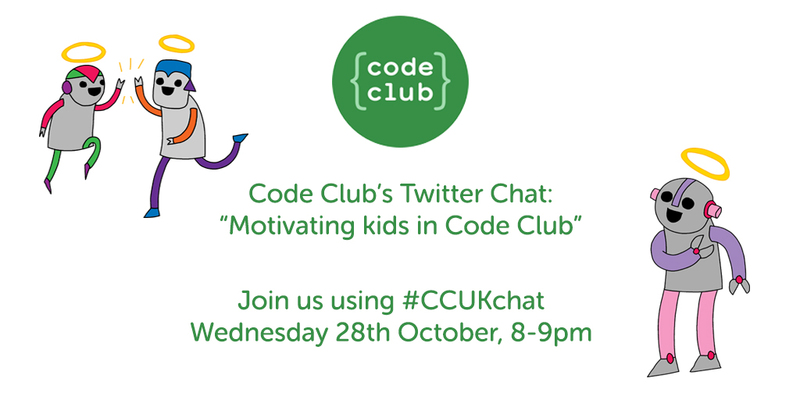 Join us for Code Club’s third Twitter Chat! Following on from the success of our past Twitter chat sessions, we’ll be hosting another opportunity for the Code Club community to come together to share their knowledge and experiences, and for new or prospective volunteers to ask any questions and queries they may have. This month our focus will be “Motivating kids in Code Club”, and we’ll be joined as ever by Code Club’s Participation Manager, Sarah, to talk about useful tools for crowd control, adapting to different learning requirements, and keeping kids on task when completing the projects. We’re on the search for enthusiastic volunteers who could help us run teacher training for the computing curriculum! It’s just over one year since the introduction of the new computing curriculum in English schools. Back in September 2014, the new curriculum was hailed with cheers from the UK’s technology industry who saw the change as a first step in addressing the growing digital skills gap, whilst many educators reacted with concern. The simple fact is that most teachers were never taught to code, either at school or as part of their teaching qualification. A study from TES reflected this, revealing that two-thirds of teachers felt unprepared to teach brand new, technically focussed subject matter. 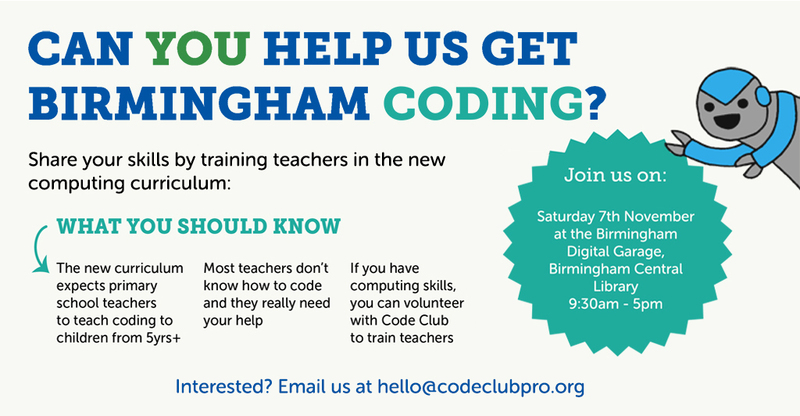 At Code Club, we have been working to change that, with our Teacher Training programme. To date we’ve trained 1186 teachers with the help of 250 amazing volunteers. This year, we have started running training sessions that are free at the point of access for teachers. It’s pretty simple really. We provide free training for volunteers with some experience, interest or passion in computer science to run sessions for teachers. All materials you need for sessions with teachers will be provided. You will also receive a full training day about how to deliver effective training. Teachers can sign up on our website. They provide contact details and several dates that they want training. On our training days we match volunteers with schools based on their availability. What training do we offer you? It’s a full day’s professional seminar. There will be anywhere from 10 to 20 people involved. The day itself is run by Ali Redmore, former executive director of the Science Learning Centre, and teacher. On the day we give all sorts of tips and tricks about how to run sessions, how adults learn, behaviour management, in depth look at our materials and setting up your first session. Most people that attend a training day have never taught before. We welcome anyone who has an interest in computer science and helping teachers. I’m interested, where do I sign up? Head to www.codeclubpro.org/become-a-trainer and sign up. Our next training session for volunteers is in Birmingham on Saturday 7th November 2015. We’re looking forward to meeting you!